The Washington University team has collaborated with leading industry partners to overcome unique challenges in designing the concrete residential building. The CRETE house footings, walls, floor, and ceiling are all made out of pre-cast concrete. The walls consist of sandwich panels- structural concrete on the interior, insulation in the middle, and UHPC (Ultra High Performance Concrete) on the exterior. 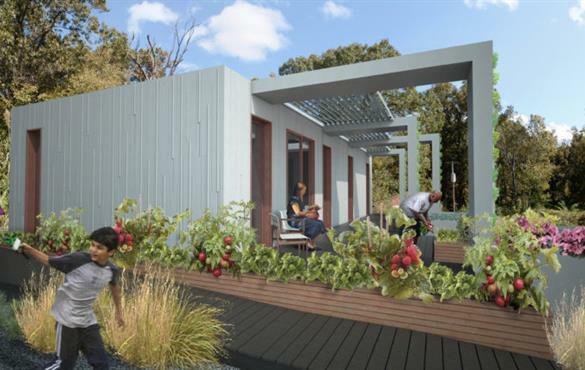 Although construction of CRETE House is currently taking place on the North campus of Washington University, it will be disassembled and shipped to Denver, Colorado where the team will put it back together in time for the Solar Decathlon competition. Therefore, modularity was integral to design. All the systems – mechanical, electrical, and plumbing – are directly attached to a steel “core” that sits in the center of the building. The entire house can be erected in under a week. Additionally, CRETE House is not designed to use a traditional HVAC (heating, ventilation, and air conditioning) system; instead, tubing in the floors and ceiling carry cool or warm water, to adjust the interior temperature. Due to the concrete’s thermal mass, the house can act as a thermal battery and cut down on heating/cooling costs. A solar array is fixed to the roof and generates all of the daily electrical needs. This level of systems and architecture integration is often only seen in multi-million dollar buildings. The innovative design of CRETE House has provided an opportunity to tackle one of the most important challenges for sustainable construction – CO2 emissions. Preliminary calculations show that CRETE House saves significant CO2 emissions over the life cycle of the house, despite the higher carbon emissions to produce the structural materials. A large chunk of these CO2 savings come from the increased lifespan of concrete, indoor environment regulation system, and reduced maintenance. CRETE House, as well as 13 other innovative houses, will be on display in Denver, Colorado from October 5-15th, 2017. The Solar Decathlon is open to the public and all are welcome to visit. The house will be permanently installed at the Tyson Research Center for visiting scientists, during the winter of 2017-2018. To track the progress of Team WashU and CRETE House, follow them on their website, Facebook, Twitter or Instagram pages. It’s that time again! With the latest design nearly complete the ground is rumbling with the sound of construction as the next Missouri S&T Solar Decathlon entry is taking shape once again. The team is made up of students, faculty, staff, industry partners and a few others. For the 7th time the team is constructing a new house for the U.S. Department of Energy Solar Decathlon. This newest house, called SILO, will compete in Denver against other collegiate teams in October. What is behind the name? Well SILO is so much more than just a self-sustaining, net-zero home. The “S” in SILO stands for smart, represented by a home automation system that enables the homeowner to live efficiently and at ease. “I” for innovative; the numerous sustainable technologies include the solar array, greywater reclamation, and on-site energy storage. “L” represents living. The home’s abundant greenery and modern appliances combine for comfortable, smart living. Additionally, ample sunlight, clean air, and relaxing atmosphere create the “O” in SILO, which stands for oasis. Together, these features combine into a Smart Innovative Living Oasis, the ideal experience for any homeowner. “This has been a two year process and the team has learned a great deal about the design and construction process,” states Mr. Heath Pickerill main faculty advisor. “The experience has proven to be a great stepping stone for their careers in industry as many of team members typically get multiple offers in industry”, says Dr. Stuart Baur faculty advisor and Assistant Chair in the Civil, Architectural and Environmental Engineering Department. With the Solar Decathlon set for this coming Fall, students have been hard at work to complete construction of this house. The team is looking forward to showing of its latest entry to thousands of visitors as well as win the 10 competition areas against 12 other universities from around the world. The winner of the competition is the team that best blends design excellence and smart energy production with innovation, market potential, and energy and water efficiency. Please consider this your personal invitation to join us at the decathlon in Denver with tours available from October 5th through to the 15th. “Come out support our team and sustainable living, and most importantly, learn how you can make a positive impact on the environment with simple changes to your home”, says Luke Mueller project manager and recent graduate in Chemical Engineering. Follow the team’s progress at solarhouse.mst.edu, www.solardecathlon.gov, and on their Facebook Page. Erik Lueders, the Sustainability & Purchasing Manager for the Parkway School District, was featured on Fox2 News. Erik was interviewed while getting ready for Parkway’s Solar Dedication Event on February 19 at Pierremont Elementary School. Parkway’s solar installation, which includes 33 schools, is collectively the largest installation in Missouri. Kudos to Erik and Parkway. Not only are students able to experience real-time data on how much energy the school is using, but the district will save $15,000 in the first year after installation. Check out Erik in the news here. CEO of Express Scripts, George Paz, recently described the Missouri Botanical Garden as “a world leader in the green movement” and “one of the region’s finest civic institutions.” Quite a title to live up to, wouldn’t you say? Well Express Scripts sure does believes in the Garden, because they have partnered with Missouri Botanical Garden by providing the initial investment for 110 solar panels atop the Commerce Bank Center for Science Education (CBEC). CBEC is the new home of both the Earth Ways Center of the Missouri Botanical Garden and the USGBC-Missouri Gateway Chapter. Now doesn’t all that seem worth the initial investment?! Leading municipalities across the nation are partnering with the U.S. Environmental Protection Agency (EPA) to become a Green Power Community (GPC). Green Power Communities are cities in which the local government, businesses, and residents collectively buy green power in amounts that meet targets set by the EPA. In April, Clayton’s Board of Alderman committed to pursuing the GPC designation by unanimously passing a resolution to embark on an GPC Challenge via a joint effort of the City of Clayton, AmerenUE Pure Power and Clayton-based, Microgrid Energy. The Green Power Community Challenge focuses on encouraging local businesses, residents, and non-profit organizations to support new sources of renewable energy and reduce the City of Clayton’s carbon footprint. In addition, Challenge events and activities will include a focused renewable energy education effort for Clayton residents and businesses, and in particular, the students in the Clayton School District. Enroll in AmerenUE Pure Power or any other Green-e certified voluntary green power program. Each Renewable Energy Credit represents 1 megawatt hour of renewable electricity generated and delivered to the grid, which means one less megawatt hour of conventional power. Each Renewable Energy Credit also represents the environmental benefit of displacing pollution from traditional energy generation with fossil fuels. And specifically, Pure Power Renewable Energy Credits support Missouri wind farms, which keeps environmental benefits working at home. Install an onsite green power system. GPC Challenge partner Microgrid Energy is a Clayton-based business offering a 10% discount to any Clayton business or resident who installs during the Challenge (before April 22, 2011). Each kilowatt-hour of power generated from a Clayton based solar electric system will count toward the Challenge goal. The good news is that either option supports more local and renewable energy sources. The even better news is that opting for one or even both will help the City of Clayton achieve its Green Power Community Challenge goal. To learn more about supporting the Clayton Green Power Community Challenge or to find out how your community can get involved – see the City of Clayton’s press release or Ecology webpage or visit the EPA’s Green Power Community Challenge website. – Submitted by Cindy Bambini, an employee of 3Degrees and a USGBC-STL Green Schools Subcommittee member, and Rick Hunter, an employee of Microgrid Energy and a member of the USGBC-STL Advocacy Committee.